The rooms were spacious with their own bathrooms. The house is very well maintained. The chef cooks well, perhaps to see a little more variety in the dishes, especially dishes suitable for children (not too spicy). The pool very well maintained and the garden. The location between 2 villages, very convenient bus network. The driver assigned to the villa leads well, his car is perfect. By cons there is nothing explained, nothing advisable, do not always listened when we asked local restaurants. Professionalism of the team of home and care very valuable to the owner who came quickly offer us his help when a child was injured. We recommend this villa. Five years on and our love affair with Southpoint Abbey is as strong as ever! Yes, we've tried other places and, yes, the ever-increasing range of beautifully designed properties is jaw-dropping. But that's not what the Abbey is about. For us it's dependable and solid: from the thick coral and limestone walls, to its amazing beach location to the beautiful people who work at the Abbey and those who live in the local villages. It can be hard picking a place when you're not sure what you're signing up for, so here is a list that works for us and might help you: - a comfortable old home built in the local architecture (was once a small convent) - wide upstairs and downstairs decks with views of the ocean and the headland - landscaped gardens, an immaculate infinity pool and the ocean/beach at the bottom of the garden - a great stretch of clean sand for long walks - yummy, yummy food - easy access to Galle Fort (35 minutes away), tea factory, turtle project, local temples etc - staff who really care and take pride in what they do and know when you feel like a chat and when you want alone time. Guess what we like best is that we never feel like we're just visitors but that we're part of the community and that we belong. We had the most wonderful time staying here over New Year. The position of the Abbey within a few steps to the Indian Ocean was fabulous ,lovely pool and garden , extremely well appointed house, with airy comfortable rooms and lovely verandas to relax on . What made our stay so special was the kind and attentive staff who looked after us and the food was delicious . We will return ..! 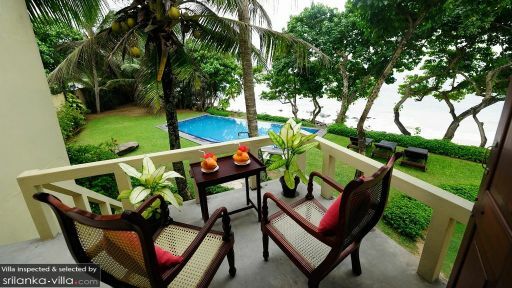 We recently stayed at South Point Abbey which is situated on the beach next door to South Point Villa. The two level house is situated in a lovely tropical garden setting overlooking the sea with lovely verandahs upstairs and downstairs and an infinity pool. All our meals (which are optional from a menu and at an extra cost) were served to us on the downstairs verandah. The chef is fantastic and we found the food to be well worth the money spent. We have even come home with some delicious recipes which he kindly shared. 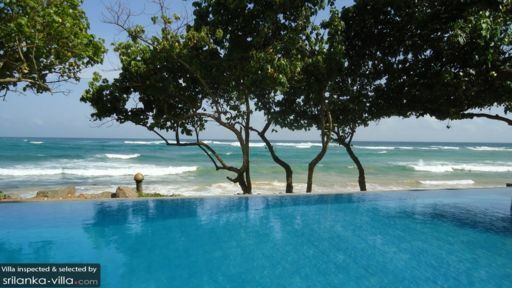 The property is approximately 15 - 18 kms from Galle itself so guests can either use the local "tuc tuc" transportation or the South Point driver and vehicle. We did find this transport to be somewhat expensive but still used it on a few occasions as we felt it to be a safer option. However the "tuc tuc" rides we did take were tremendous fun. The house is fully staffed and we cannot speak more highly of them. Besides the glorious views and very comfortable accommodation, the excellent staff certainly helped to make our holiday so memorable. Their constant smiles and outstanding service were above and beyond what we had expected. South Point Abbey does have a busy road running behind it but with the sound of the sea at night, we were not particularly disturbed by the noise. All in all, we had a fantastic, relaxing stay and hope to visit again in the future. We would definitely recommend South Point Abbey. 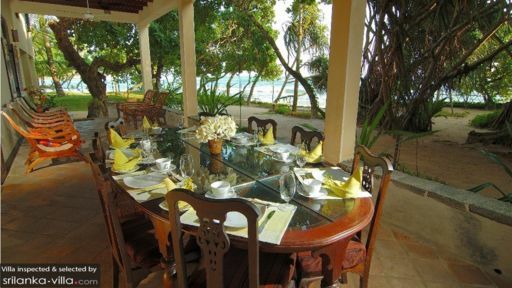 Stayed with children and grandchildren at South Point Villa (Abbey) for eleven nights during Christmas. The place is suitable for a family with small children, and with plenty of space, so that you can have privacy if needed. The staff was very friendly and professional at the same time, and they met every need we had during our stay. Also the food - especially the Sri Lankan dishes - was superb and there was plenty of it. Lots of things to do in the 'neighbourhood' and the staff are very helpful if you need any help with arrangements. Fantastic to be able to have a swim in the ocean before breakfast is served on the terrasse. Beware that although the beach is wonderful, the sea is rather rough and not suitable for smaller children, but then there is the swimmingpool. Also it might be worth noticing that there is some noise from the traffic on the main road behind the house, but we soon got used to it. All in all a stay at South Point Abbey can be highly recommended. Our family of 4 stayed for XMas 2013 8 days at this beautiful Villa. We have traveled in many places around the world including the obvious Four Seasons, Six Senses and other luxury places but this Villa has topped them all in terms of privacy, beach, rooms, food but especially the staff that have been amazing! We will return and already looking forward to it.